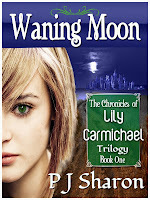 When I first had the idea for THE CHRONICLES OF LILY CARMICHAEL, the story came to me in a trilogy. After many discussions with friends and neighbors about where they thought the world was headed, it seemed that Doomsday Preppers might not be so crazy after all. It’s not hard to imagine some catastrophic event that could send the world we know into chaos. Especially with books, movies and TV shows exploring it in high-def with shows like REVOLUTION and FALLING SKIES, both brilliant depictions of a post-apocalyptic world in the near future. The first book, WANING MOON, just released on September 28th, lays the groundwork for a post-apocalyptic story set in the year 2057. Having previously only written contemporary YA, I wasn’t sure if I had enough of a sci-fi imagination to go too far into the future. By having the story take place in the next fifty years, I was able to use much of our current technology, but I added a bit of a twist here and there to make it interesting, yet feasible. The premise of the trilogy is that a fast mutating viral plague wipes out three quarters of the population and a polar shift threatens the rest of humanity with extinction. Pretty big stakes for our sixteen-year-old genetically altered heroine, Lily Carmichael. Lily’s mother was a geneticist at the time the plagues were ravaging the world. In an effort to save future generations, she discovered a way to genetically alter fetuses so that they would be immune to the virus. When a rogue government agency, the Industry, takes over the experiments a few years later, things go terribly wrong and Lily’s mother dies giving birth to a son. The Industry sets out to capture all of the kids involved in these experiments, set on using them for their own nefarious purposes and Lily’s father is murdered trying to protect his children. Lily and her brother grow up hiding in the hills with their uncle. Thirteen years later, with the virus eradicated, the world is on the cusp of recovery. As a side effect of the genetic alterations, Lily’s younger brother, Zephron has been imbued with the power to take life with a touch, while Lily has the ability to heal—everyone except her beloved uncle Samuel who is dying of cancer. 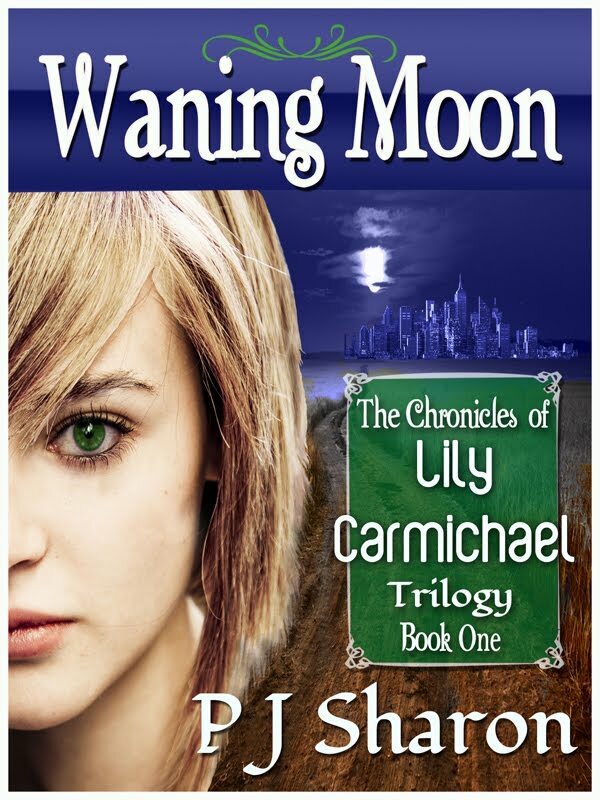 WANING MOON, Book One in the trilogy, follows Lily’s journey to the trade city of Albany where she must find the medicine that will cure Sam. Along for the ride is Will, a young drifter in search of his father. But Will has secrets of his own, and escaping the city proves to be more dangerous than Lily ever imagined. In creating a dystopian world forty-five years in the future, I had to imagine that even if technology still moved forward, there would also be many ways in which the world would go backward. Without three quarters of the world’s population, the economy would undoubtedly collapse, manufacturing, transportation, communications, and government would all lack an organized infrastructure. Although there would be vast resources, stockpiles of goods, and abundant real estate left abandoned, distribution and control would definitely be a problem. Imagine 75% of the law enforcement, military, and medical personnel gone in a matter of a few years. As if a global pandemic isn’t scary enough, I added Mother Nature’s wrath to the picture. We can all imagine where global warming or a slight polar shift might take us in the next forty years. In my dystopian world, the US is divided into sectors. Lily, Zeph and Sam live in the Northeast sector where they are brutally assaulted with as much as fourteen feet of snow in the winter. Spring comes with heavy flooding and mud season, and summer temps routinely reach 105 degrees. Luckily, humans are the most adaptable creatures on the planet. Sam is an engineer and has managed to keep the family living in relative comfort in the hills outside of a small town called Stanton. With solar power, wind turbines, and geothermal heating and cooling systems, they are able to grow food year round in greenhouses and whatever they don’t have, they trade for with neighbors or make the trip to the trading post in Albany with several other of Stanton’s residents, including the creepy local constable’s son who has a crush on Lily and isn’t at all happy to have Will along for the trip. In Book Two, WESTERN DESERT, we’ll get to see Lily and Will travel across a post-apocalyptic US to rescue Zeph from the Industry. I have lots of research to do, but imagine if a tsunami destroyed the entire west coast and states like Nevada were now considered beach front property. Add a drought-ridden Midwest and you have what will become known as the Western Desert. Rising seas and tidal surges leave the south in ruins, aptly called the Southern Swamps. Check out the TV show Swamp People if you wonder how folks might adapt to such an environment. Book Three, WINTER’S SUN is still in the concept phase, but I promise there will be light at the end of this bleak tunnel. Oh, and did I mention there are wolves? And of course a romance—because who doesn’t love a good teen romance? I’m a firm believer that there is always hope. Lily is a healer for a reason, and although like all teenagers, she struggles to find her identity, I have faith that she will not only prevail in the end, but that she and the next generation will find a way to survive no matter what challenges they face…whether it be on this planet, or in a galaxy far, far away. 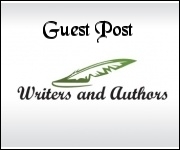 Guest post by PJ Sharon. "I knew I would be a writer someday when I was a little girl sitting on my grandpa’s knee and telling him stories that he would help me put on paper. By the time I entered kindergarten I could already read and write, and I couldn’t wait to look up new words every morning in the ginormous Webster’s Dictionary that sat in the book case at the bottom of our stairs. I would get on the bus and ask my friends, “Do you know what pulchritudinous means?” Between that and challenging the boys to push-up contests at the bus stop, I mostly sat alone on those bus rides to school. But that just meant I had more time to make up stories. I went on to many other endeavors in life, including the world of figure skating, and later, earning a black belt in martial arts. Though I was a mom at seventeen, I did manage to finish school and somehow made it through college, earning a degree as a Physical Therapy Assistant. After nineteen years, two sons, a divorce, and some fairly lean years, I found that it’s true what they say about life beginning at forty. It was about that time when I reunited with the love of my life and worked my way to owning my own business as a Massage Therapist, Personal Trainer, and Yoga Instructor—all of my favorite things. To make my bliss complete, I moved out to the Berkshires and found my muse waiting for me there amongst the lilacs and humming birds. I now write Extraordinary Stories of an Average Teenage Life in order to share hope with others, especially teens, that no matter how tough life gets, there is always a bright spot waiting just around the corner. 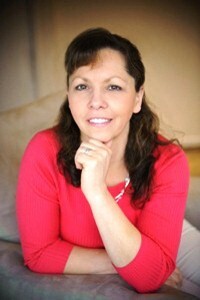 My published books include the award winning YA Novels, HEAVEN IS FOR HEROES, ON THIN ICE, and SAVAGE CINDERELLA, available through Amazon and B&N Booksellers". I would not want to live in your Dystopian world, but I am looking forward to reading about it. 45 years into the future is not that far away. I wonder!! Thank you for hosting PJ today. 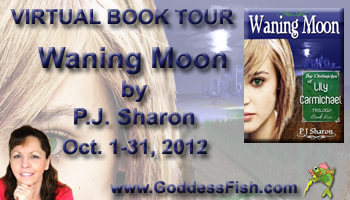 Thank you, Goddess Fish promotions for setting this up, and thank you to Writers and Authors for having me. I look forward to hearing from your readers. So does anyone have any ideas about what the country might look like in 45 years? Your ideas may end up in the next book! Hi Mary, yes, my future world sounds a bit grim, doesn't it? If you look around the world, though there are many grim realities that currently plague our world, yet we manage to keep going, surviving, living, building, and thriving under the most difficult of circumstances. The backdrop for the story is a little town called Stanton, where a community has risen up and found a way to work together, share resources, and create a working environment for its people. I wanted to show that we can adapt if we all work together and I wanted to give Lily something she needed to be willing to fight for. In the second book we will get a glimpse of both the destruction and the beauty of this new world as she and Will travel across the country. How wonderful that your life took such a sweet turn in your 40s. It's a powerful message about never giving up. I watch Revolution--it's actually filmed in the town where I live and work. We like looking for the local landmarks. I like dystopian fiction--especially with female protagonists. Nice seeing you again, Ingeborg. Thanks for stopping in. Hmmmm...2057? I sure hope those aren't Rose Colored Glasses - I'd love for us to last that long...not looking too good right now from my viewpoint (might I say Novemember will tell?) Anyway your book sounds very creative and that is always a good thing! I hear you, Vamp. Interesting times we live in, and how scary is it that one moment--or one elction--can change everything. Through it all though, I have hope that there is a larger plan at work for all of us and that somehow we will adapt, improvise, and overcome. Thanks, Suzie. I'll finish the trilogy and then who knows what my brain will come up with next. I do have another contemporary YA in the works that I'd like to get back to. Thanks for asking. I'll be out for a while this afternoon and evening, but will reply to comments as soon as I can. I'm still waiting to hear what others see in our future world. I would love to credit you in the next book if I use any of your ideas. The thing is, that technology won't just disappear. Even if things fall apart, I believe we will adapt and overcome. Maybe things won't be what we thought they would, but maybe in some ways they will be better. How often have you cursed our addiction to TV, the internet, our enslavement to our phones, our dependence on fossil fuels that is destroying our planet? Maybe an apocalyptic change is needed to make the correction necessary for our survival. Interesting to ponder. I really love the story line. It really makes you stop and think about the future. Thanks, Jane. It has been an eyeopening adventure writing this book. The research alone has had my head spinning with possibilities. I'm excited to write the next book and see how Lily and Will make it across the country and all of the adventures they have along the way. First - Thank you for having PJ post today. Unless the human race is totally annihilated, we will always adapt because that's what we do - it's our nature and we're good at it. We just make mistakes a long the way and unfortunately some have huge consequences. Good post PJ! I agree, Donna. That idea comes through in the story. Sam's (Lily's uncle) motto is adapt, improvise, and overcome--a takeaway from the military--but true survivalist thinking for sure.